“Yeah, it was cool,” she said later. “But I’m just honestly just really happy that we played really well. It’s so fun when you’re moving the ball. … And everyone scored tonight, so just being able to get that last game that we all have together here with this particular team on this home court was awesome,” she said. 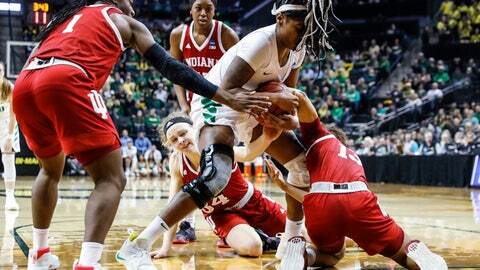 Indiana: Indiana has faced Oregon just once before, falling 77-56 back in 1984 at a tournament in Portland. … The Hoosiers are 8-5 all-time against the Pac-12. … Indiana has collected at least 20 wins for the fourth straight season. Yeaney is from Portland, Oregon, and went to St. Mary’s Academy. She had a large contingent of fans at the game in Eugene, about a two-hour drive to the south. Oregon: Oregon Governor Kate Brown was at the game. … Oregon shot 59 percent from the field in the first half, and 51 percent for the game. Erin Boley finished with 14 points, including four 3-pointers.